Late month I’d got an order from my neighboring client to build a pulse width modulation to dc voltage converter module that’s compatible with common microcontrollers and PLCs. Since it’s a fussy time for me I ordered a readymade module, the so called “PWM to Voltage Module”, from Amazon (see the pic) and handed over to him. Later I discovered that it’s a mere piece of electronics trading at sky-high prices. So finally I plotted the (minimal) design of a new module for the time to come and succeeded with great results in the end. A happy outcome! 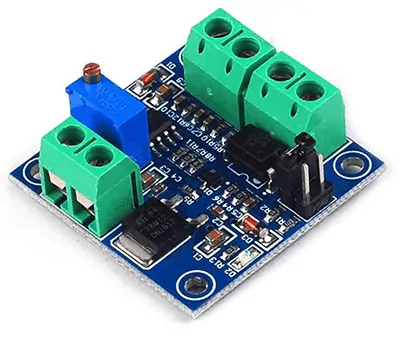 Since the pwm to voltage converter converts inputted PWM digital signals into 0 to 10V analog voltage it can be used as the switching interface for PLC or and other microcontroller based controller/driver boards. Here, the output voltage can be regulated by varying the duty cycle of the pulse width modulation. On paper, pulse width modulation (PWM) is a technique of encoding a voltage onto a fixed frequency carrier wave. In PWM, instead of varying the modulation frequency with voltage, output is merely switched on and off at a fixed frequency so that percentage of the on-time is proportionate to the signal voltage. With the help of any microcontroller that has PWM, it’s easy to output a PWM signal using the “analogWrite” function in Arduino (AVR microcontroller) for example. However this will output only a PWM signal not actual voltage. The little circuitry given here can quickly and easily convert the PWM output from a microcontroller into a voltage corresponding to the percentage of the PWM. Yes, now you will have a simple digital to analog converter (DAC) for the common microcontroller without on-chip digital to analog converter. Look below for the system diagram of the proposed pwm to voltage converter. 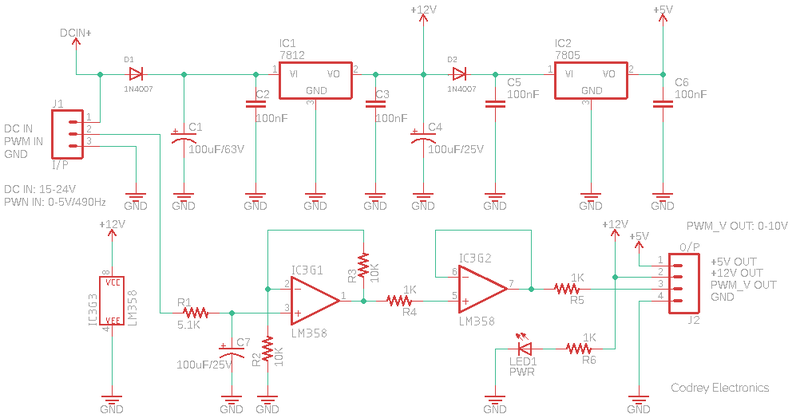 As stated, the system converts 0-5V PWM signal input into 0-10V analog output. The entire system can be powered from any 15-24V (>500mA) dc power supply, and there’s an onboard auxiliary 5V regulated dc output for running external peripherals. The recommended (default) input pulse width modulation frequency is 500Hz +/- 2%. Curious readers may be wondering how I calculated the above RC values. 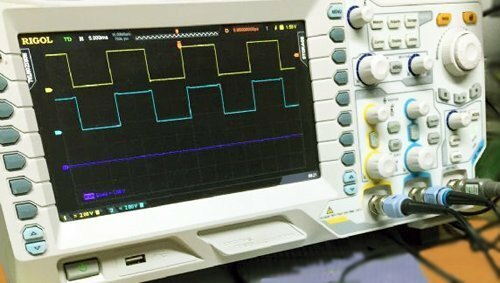 In order to pass only the dc component of the pulse width modulated waveform, a low-pass filter with a cutoff frequency much lower than the fundamental frequency of the pulse width modulation pulse should be required. I did it on an empirical basis (an acceptable trade-off to cut out unnecessary complexity and cost) because it worked like a charm. 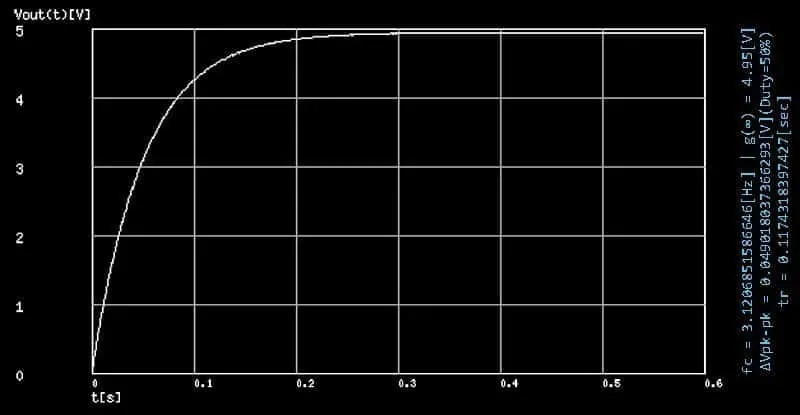 The gracious thing about the math is, counting on your measures, there are often multiple practical RC values for the low-pass filter! Arduino (Uno) has total 6 pins that can be configured for PWM output. The PWM signal on pin D9 (D10 as well) provides an output frequency of 490.196 Hz, so we can take it to test our prototype. 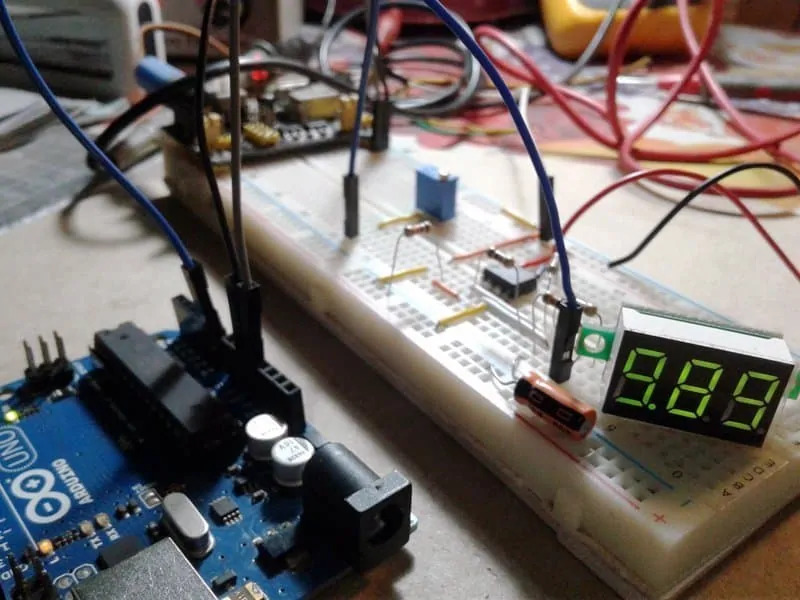 Just copy-paste-upload the given test sketch, connect a multi-turn 10K trimpot at A0 (+5V-A0-GND), and feed output from D9 to the input of the pwm to voltage converter module. And then vary the trimpot to ensure that the output shifts successively in 0-10V scale. Righto? A word about ripples – in my quick experiment the LPF consists of a 5.1KΩ resistor and a 10uF capacitor. With 490Hz default PWM of Arduino, this kicks in about 31mV of ripple (0.00624×5) at the input of the op-amp converter. If this is too much for a distinctive application, it would be good to increase the pulse width modulation frequency and/or try a higher order low-pass filter. A bit hard to handle indeed!